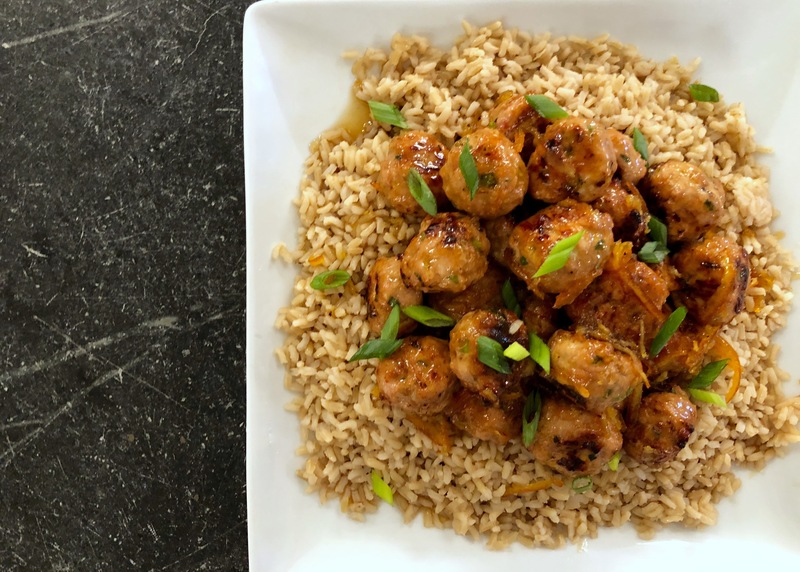 The sauce on these meatballs tastes just like Chinese takeout Orange Chicken! If you can’t find ground chicken, use ground turkey. In a large bowl, combine the ground chicken, breadcrumbs, milk, garlic, ginger, green onions, and soy sauce. Mix to combine and form into small meatballs. Bake meatballs on parchment covered sheet pan for 6-7 minutes, flip the meatballs, and bake another 6-7 minutes (14-15 minutes total). While the meatballs are baking, prepare the sauce. Add olive oil to a small saucepan over medium heat. Add the garlic and ginger and cook for about 2 minutes, stirring. Add the red pepper flakes, soy sauce, and orange marmalade and cook, stirring occasionally, for 5 minutes until the sauce has thickened slightly. Remove the meatballs from the oven and transfer them into a large bowl. Pour the sauce on top and toss to coat. Serve with rice and garnish with green onions. 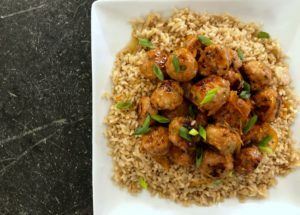 Copyright © 2018 Our Everyday Dinners - This is an easy recipe for how to make Orange Chicken Meatballs.